With so many men’s fashion bloggers online vying to expand their footprint, it can be quite overwhelming to know which specific bloggers you should focus on. The 25-year-old is the editor and blogger of The Side View, an online German men’s fashion blog to complement his impressive Instagram account, which has over 135k followers. He discusses style tips, showcases key outfits-of-the-day and upcoming metrosexual trends. While his so-called motto in developing his brand is “Reflection, Emotion, Inspiration,” Konstantin has said in his blog that what makes his overall brand stand out from the countless other fashion blogs is his genuine passion and desire for perfection. Although his professional fashion blogging originated as a mere hobby, this has since blossomed into a major passion in his life. Beginning over two years ago, it also resulted from his innate passion for adventure, versatility, style, and self-care. Having his Instagram posts mostly in English and his blog in German, allows Konstantin to attract a somewhat bilingual audience. Orignally from Cologne, Germany, Konstantin is a fashionisto who embraces a fusion of European and American style ideals. For his European-inspired wardrobe, he often goes for sharper and exquisitely-tailored items to project confidence, as if not worrying if his choices may attract confused looks and raised eyebrows from passers-by. This is evident in how he posts himself being adorned with tight-hugging dress shirts, gentleman-inspiring turtlenecks and an assortment of loafers. At the same time, he also embraces more relaxed-looking streetwear to have a youthful American look. He’s shown appreciating items like the undeniably-attractive bomber jacket, striped trousers, and sneakers from brands like Nike, Vans, and Puma. To spice things up, he is not afraid to experiment with bold patterns, stripes, and florals. What also drives him is his love for travel and lifestyle. 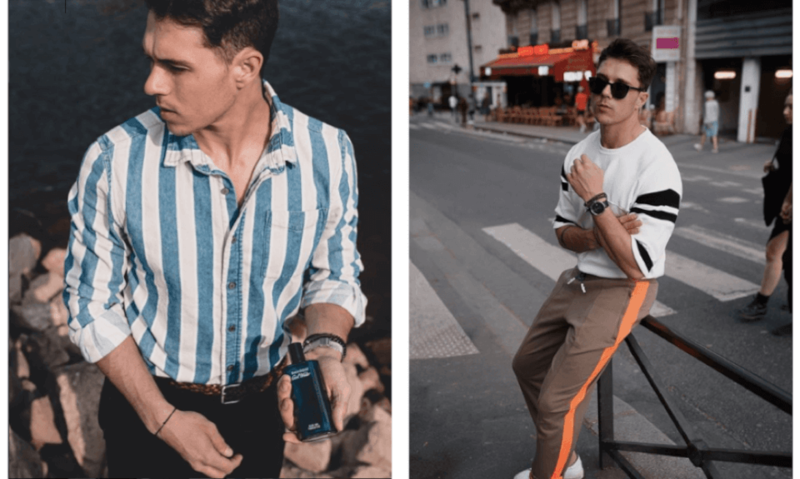 On his Instagram account, he regularly posts outfit ideas and provides his readers with information on where to purchase individual items of their linking. Overall, this aims to offer inspiration to his transatlantic male-centric audience. alLike great fashion bloggers, he has chosen a color palette with his overall photography: grey. While his posts have colorful outfits, there is an undeniable grey hue or filter, which helps give it an overall metropolitan look. He has also collaborated with multiple brands throughout the years to go beyond fashion and also promote items like colognes and sneakers. These include Braun Beauty Deutschland, Davidoff Parfums, Levi’s Germany, Vans and Armani Exchange. As he operates from Germany (a prime location in Europe as it’s close to fashion capitals like Milan, Paris and London), he has traveled extensively to expand his brand. He even has a Travel page on his blog where he documents his traveling experiences. Locations he’s visited and posted about include Malaga (Spain), and Santorini (Greece) and Milan (Italy). Konstantin Krayer takes advantage of the overall famous blue-and-white hues of Santorini during his stay there. For example, in October 2017, he recounted how apartment hunting in Cologne, Germany, stressed him out as it was difficult to search for a new home in such a major European city. This motivated him to take a break and join his parents on a sailing trip along the Amalfi Coast in Italy, eager to embrace the “Dolce Vita” (Italian for “sweet life”). There, he visited locations like Naples and Procida, while warning his readers that sailing is genuinely a physically demanding sport and activity. He suggested having waterproof luggage or bags for any sailing trip. During his “Dolce Vita” vacation, he used a Touch Duck Medium Trolley from Mandarina Duck which has numerous compartments and came with a waterproof laptop case too. Konstantin Krayer on his way to his Italian “Dolce Vita” sailing trip. Below are some looks worth emulating, if you need some stylish inspiration!